Why am I sinking when I start rotating my arms? I think I do not have the correct arm movement for freestyle swimming. There are a few reasons why you might start to sink as you begin your arm action during freestyle swimming. The cause could be down to a lack of propulsion, your body position or a combination of both. It could also be that you are not relaxed enough and that your body is too ridged making your swimming stroke tense. Freestyle swimming technique gets the majority of its propulsion from the arm action. The legs kick mainly to provide balance and support, especially over a long distance. If you fail to pull hard enough to generate enough propulsion then the result will be that sinking feeling. Body position is crucial to maintaining a streamlined movement through the water. Freestyle body position must be a flat position at the water surface. This flat position is only achieved when the face is submerged – only the face and not the entire head. The most common mistake is to raise the head to face forwards when breathing or have to face permanently out of the water from the start. Any movement upwards of the head will cause the legs to sink. Breathing technique for freestyle should be a rolling of the head to the side. Combining correct body position (including the head position when breathing) with enough propulsion from the arm action will result in smooth freestyle swimming technique. 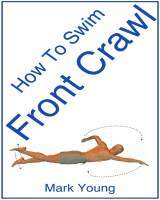 My eBook How To Swim Front Crawl contains over 20 separate exercises covering all aspects of the swimming stroke including body position, arm action and breathing. You can download it instantly, print out the exercises you need and take them to your pool to try out. The exercises are very clear and easy to follow and will help your freestyle swimming technique. Click the link below for more information. I need some help with freestyle breathing technique with limited neck movement I have an adult pupil who has limited neck movement, any ideas on how to get him to breathe efficiently when doing freestyle. If your adult pupil has a physical problem with their neck that prevents them from moving through a normal range of movement, then there may be little that can be done to achieve an efficient breathing technique. He may have to sacrifice stroke efficiency for a larger shoulder roll in order to turn his head and take a breath. However, ensure that the timing of the breath is correct. In other words make sure his arm is fully through its propulsive phase and out of the way of the face as he breathes. If the breath is early or late then the arm and shoulder will limit neck movement. Also ensure your pupil is not attempting to turn his head too far in an attempt to breathe. The head needs to be turned just enough for the mouth to be clear of the water surface in order to inhale. Ensure he is trickle breathing (exhaling underwater) so that when he turns his head to breathe he only has to inhale, unlike explosive breathing which takes longer and is more tiring (holding his breath while swimming and then breathing out and then in in the short time his head is turned). Depending on the needs of your pupil, breaststroke is always easier from a breathing perspective and it also requires no turning of the head and neck. If he is a beginner then maybe consider this. If it is his wish to pursue freestyle then hopefully the above will help.